Unlike South Korea which submitted itself to the US for security protection, North Korea has never compromised its national defence with China. That is despite often cited historical precedents: the Sino-North Korea Mutual Aid and Cooperation Friendship Treaty which remains effective until 2021; and China’s participation in the Korean War (1950-53) which caused 180,000 deaths of Chinese soldiers. While these precedents resulted in the term of “blood allies,” the empirical details reveal the description being close to a euphemism at its best, or a hyperbole at its worse. The Sino-North Korea Friendship Treaty stipulates China’s obligatory intervention in times of external attack against North Korea. As North Korea has not been attacked by external forces since the treaty was signed in 1961, China’s willingness to abide by the agreement remains to be seen. This is regardless of North Korea’s self-perceived state of war in times of US-Republic of Korea joint military drills which clearly aims to deter North Korea. China’s crucial assistance during the fratricidal war, which quickly turned into the first “hot war” of the Cold War, was never recognised by Pyongyang. The North Korean leadership chose not to express its gratitude to Beijing in the usual salutary method of building commemorative memorials. Statues of Mao Zedong or Peng Dehuai are nowhere to be found on the North Korean soil. The remains of Mao Anying, the son of Mao Zedong who died fighting the Korea War, were never returned to China. Furthermore, Pyongyang sided with the Soviets in times of Sino-Soviet conflict in the 1960s and 1970s. The deep distrust between the “blood allies” dates back to the Minsaengdan Incident of the 1930s where the Chinese Communist Party purged about 80 percent of North Korean Communist guerrillas. The incident took place in Manchuria under the Japanese rule. While both the Chinese and North Korean Communists were fighting against Japanese colonialism, the Chinese developed unfounded suspicion against North Koreans that they were collaborating with the Japanese. That led to a massive purge against the North Koreans. Kim Il Sung, then a partisan resistant leader who established North Korea in 1948, lost most of his comrades from the purge. The content of their relationship reveals the entanglement of situational imperatives and running distrust. Kim Il Sung allegedly warned of China’s untrustworthiness at his deathbed by saying “Never trust China. It never helped us in times of need.” This carries much significance for North Korea’s stance vis-à-vis China considering the living legacies of the Eternal Leader, Kim Il Sung. The international community has placed Beijing under mounting pressure by calling for a more active role in controlling North Korea. China is regarded as North Korea’s only remaining ally as they avoid adding their voice of denouncement in the international arena. The country often votes with other traditionally non-aligned nations such as Indonesia, Egypt and Cuba at the United Nations. China often argues against heavy sanctions against the Pyongyang regime citing its adverse effect on regional stability. China is also a party of the now-stalled ‘Six Party Talks’ consisting of the US, Japan, Russia, North and South Korea. Whilst the Friendship Treaty is bilateral in its nature, the Six Party Talks operate within a multilateral framework. The latter suggests Beijing’s intention to embed the North Korea problem into the hands of a multitude of regional stakeholders. China’s involvement in North Korean affairs is limited to a superficial level of engagement. As Chinese officials are often quoted by expressing their frustration with the Kim regime, recent polls show that majority of the Chinese hold negative views towards North Korea. The rationale behind the international pressure lies with geographical proximity, economic interdependence and historical alliance. China shares its borders with 14 countries, North Korea happens to be one of them and its trade dependence on North Korea totalling $6.86 billion vis-à-vis other trading partners is relatively insignificant. Given North Korea’s Juche ideology which indoctrinates the principles of chaju (independence), charip (national economy) and chawi (self-defense), its reliance on China is exaggerated. While the list of causes for mutual dependence seems sufficient, it is missing one crucial condition: trust. The world wrongfully overestimates Beijing’s ability to modify Pyongyang’s behaviour. Unless the agent for change and its recipient click in mutually meaningful chemistry, behavioural modification will not happen. Mutuality demands the crucial element of trustworthiness where Sino-North Korean relations are concerned. 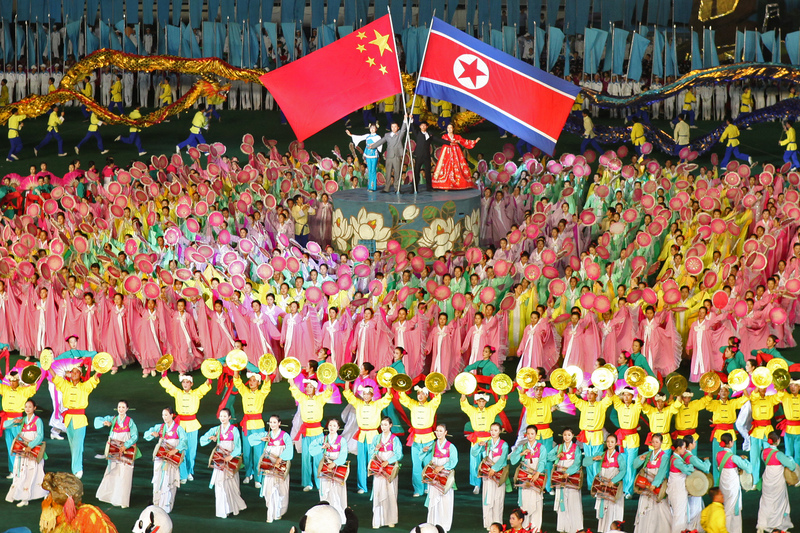 The Chinese government’s detachment from North Korean affairs needs a heuristic analysis. Neither the perspective of normative appeal nor cost-and-benefit calculations will be helpful in explaining Sino-North Korea relations. In addition, we need to factor in the element of trust as an outcome of the psycho-historical process. Unless the combined elements of norms, strategic calculations and trust are balanced and factored into our thoughts, China’s thin engagement of ‘half-in and half-out’ is hard to explain. Unless China has enough of a convincing motive it will not give in to international pressure. North Korea, on the other hand, will not change its isolationist Juche trajectory lest the shifts in internal as well as external environment persuade it to do so. North Korea is a category of its own. Beijing’s policy priorities in the domestic realm include rampant corruption, rising discontent, rebellious Tibet, environmental degradation, “floating” migrant workers, the rising gap between the haves and have-nots, and uneven development between coastal areas and inland. As for foreign policy agendas, its preoccupation lies with a multitude of on-going territorial disputes, energy diplomacy with African countries, rivalry vis-à-vis Japan in Asia and the US in the world and the smooth launching of the Asian Infrastructure Investment Bank (AIIB). North Korea’s supreme priority, on the other hand, lies with its survival in its own way. Beijing’s inertia to international pressure had to change substantially following Pyongyang’s 5th nuclear test on September 6, 2016. The enhanced nuclear capability was translated into an excuse to install terminal high altitude area defence (THAAD) capability in the southern part of the peninsula. Since THAAD cannot be effective in surveying North Korea given its technical attributes, the intention behind it is clearly to monitor China’s nuclear development program thus providing a US strategic advantage. China reacted to this movement with speed and determination. It signed UNSCR 2270 which was adopted by the Security Council of the United Nations on March 2, 2016. That was to denounce North Korea’s nuclear test and sanction its trade activities. As a result, North Korea was banned from exporting coal, iron and other materials. It also put a stop to the docking of North Korean vessels at some of its ports. It went on to penalise Hongxiang Industrial Co. located in Dandong along the Sino-DPRK border for having supplied sensitive materials to North Korea’s nuclear development program. Hongxiang is also known for serving as a key main pipeline of Sino-North Korean commerce taking up about 20% of total bilateral trade. Does this mean a meaningful shift in China’s stance towards North Korea? It seems unlikely. China will continue to maintain its thin engagement given Pyongyang’s peripheral importance. It will alternate between keeping distance while reacting to situational contingencies. North Korea will also stay on its usual Juche trajectory where China is kept at bay. Dr Mikyoung Kim is a Faculty Researcher and Associate Professor at Hiroshima Peace Institute/Hiroshima City University in Japan. Image credit: CC by Roman Harak/Flickr.